I got the best sort of e-mail last week. It was from a farmer down the road wondering if I wanted to experiment cooking with fresh red currants. I believe my response was something like “heck yeah!” The farm has recently introduced some currant trials into their thriving blueberry and raspberry operation. But the problem with currants is that they have (rather unfortunately) fallen out of fashion. Luckily there are places like Highland Valley Farm that are making an effort to reintroduce them into modern cuisine. I have to admit that a fresh currant has never managed to make its way into my own kitchen. Which of course, made me wonder why. Magdalen, at the farm, directed me to asktheberryman.com for a brief history lesson. I learned that there was actually a federal ban on growing most strains of currants (and their cousin gooseberries) from 1900 until 1966. And even still, many states prohibit the cultivation of black currants. Evidentially, the shrubs can host a serious disease harmful to white pine trees. And since the white pine was a major player in the timber industry at the turn of the century, currants and gooseberries were forced to take a back seat. In fact, they pretty much got ditched all together. The white pine blister rust that the shrubs can carry is still a concern, but modern day commercially available cultivars generally have a greater resistance to the disease. Whew. I was now feeling educated enough to head over to the farm to pick up my berries. Magdalen had told me they have a few different varieties, but what she didn’t mention is how positively gorgeous they are. I was expecting a carton of plain-jane little red berries. But what I got was a mix of stunning jewels – Pink Champagne in the most perfect shade of light pink, striking ruby red Rovadas, and almost translucent white Blankas. I had my fingers into each bag before I was even out of the driveway. All of the berries were juicy and tangy – sort of like miniature grapes with a tiny seed. But right away I could detect subtle differences between the varieties. 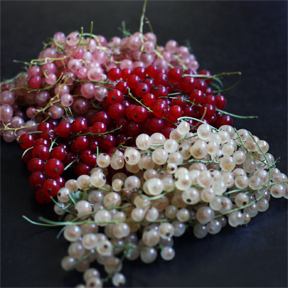 The white Blanka berries are firm and have a soft, more subtle seed. The lovely Pink Champagne seems the most delicate of the three – soft, but with an exciting flavor twist. Is “pink” a recognized flavor? Because they taste pink. And the Rovada reds are a perfect blend of both. The berries are tart, but not overwhelmingly so. Of course I’m the type that also enjoys sour cherries right off the tree. I love the rush of something tangy on my tongue. After I ate my fill of them raw, I realized my education was only half complete. I had no clue how I was actually going to cook with them. I flipped through the indexes of about a dozen cookbooks. Nothing. Not even in The Joy – my standard go to for all things old fashioned. Searching on line yielded a bit more, but I was hard pressed to find anything much beyond jam and jelly recipes. Not that I’m opposed to preserves, I just wanted something a little more adventurous. Which meant I was on my own with this comeback kid. I decided to start by baking them – straight up. I wanted to keep the currants as unadorned as possible to see how their flavor might change in the oven. So I made simple little rustic cornmeal tart shells for the berries to rest in and laced them with just a bit of honey. 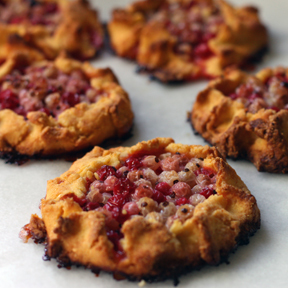 The tarts were lovely, and as I suspected, the currants mellowed somewhat in the oven. There was more of a caramelized sweetness shinning through, but still enough of a tang to warrant a small scoop of vanilla on the side. I can certainly see kicking this up a notch and making a custard based tart studded with these little gems. As I was enjoying my tart, pondering what my next experiment might be, I remembered a great appetizer that my friend Kris made a few weeks ago. She simply plated up some soft cheese, scattered red currants about and drizzled honey over the whole shebang. 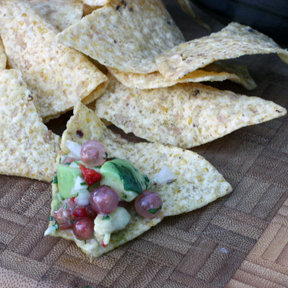 A delicious accompaniment for a basket of pita crackers. So simple, yet elegant and complex tasting. 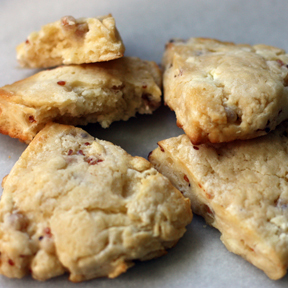 The flavor combo was such a knockout that I decided to take it one step further and turn it into a savory scone. I knew it would involve some Sassy Nanny chev and a bit of honey. But my real dilemma was which variety of currant to use. The bright red Rovadas would be the showiest for sure, but something in me really wanted to use the white Blanka. I liked the idea of a scone riddled with secret little land mines of flavor. It worked, just as I had hoped. A little bit tangy, a little bit sweet, and all with an element of surprise. I had some leftover berries mixed with honey from the tart trial, so next I decided to cook them down a bit on the stove and make a currant syrup. I learned in my online research that currants are naturally high in pectin, meaning the juice thickens up nicely on its own. I opted to slow simmer them just for a bit before taking them off and straining them though a jelly bag. I think you could cook them down longer for a thicker sauce for meats or spooning over yogurt, but I wanted a nice light syrup to add to a glass of soda water or lemonade. I set the syrup in the fridge to chill while I went to the garden for some sprigs of chocolate mint. I muddled a few leaves of mint in the bottom of a glass, filled it with ice, and proceeded as planned. Not only was my drink striking, I felt especially good knowing that I was getting a healthy dose of vitamin C and potassium to boot. Thinking about the currant’s great nutrient value reminded me that I should not overlook using them raw. They make an amazingly bright addition to my morning granola. And I can easily see tossing them into green salads and grain based pilafs. Which lead me to the idea of using them in a fresh salsa. I had an avocado in waiting on the window sill. So back to the garden I went, for a jalapeño and cilantro. 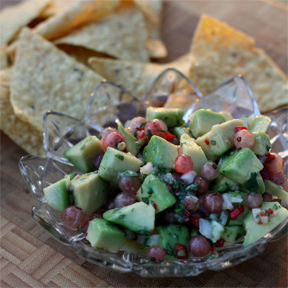 I mixed this all together with my usual culprits – honey and garlic – for a cooling summer salsa. This time around, I knew without hesitation that I wanted to use the Pink Champagne berries, simply for the preppy pink and green color scheme. Even after all of this playing around, I still had a few leftover berries for the freezer. Which will be perfect to make a small batch of David Lebovitz’s currant jam. I love the simplicity of his recipe. And If I don’t get to it, that’s okay too. I’m perfectly fine with having a bag of zesty jewels in my freezer. It’s nice to have a secret weapon tucked away. I’ve had a great week welcoming this newcomer into my kitchen. We are strangers no more. Though I’ll be honest that it took a while to get my head around the little seeds. They add a certain chewiness that can be awkward at first. But it’s sort of refreshing to be introduced to a new texture. And let’s face it, currants haven’t exactly had an easy go of things. I sort of like the notion of eating such a renegade berry. And how lucky we are to even have the chance to do so. I say hats off to places like Highland Valley Farm and home gardeners willing to give currants a second shot. Note: Be sure to use a parchment lined baking sheet. I definitely experienced some honey ooze from the filling. If the thought of this frightens you, and/or your currant/honey mixture seems particularly juicy and runny, you can add a teaspoon or so of cornstarch to thicken it up. Gently mix together in a bowl and set aside. Sift dry ingredients into the bowl of a stand mixer. Add in butter and mix until the butter is coarse and mostly broken in, increasing the speed a bit as you go. Add the cream and egg yolks and mix until combined. The dough will be crumbly, but it should come together nicely when turned out onto a floured work surface. This dough is best shaped right after making while it is still at room temperature. Form the dough into a clump and divide it into 10 equal pieces. Use the heel of your hand to flatten each piece into a 5-inch round circle, making the edges slightly thinner than the middle. Use a bench scraper and flour to aid in working with the dough. Transfer discs to a parchment lined baking sheet. Working with one tart at a time, spoon about 1/4 cup filling onto the dough and gently fold edges up toward the center. You want an imperfect, slightly ruffled looking edge. The dough is pretty forgiving, so just work with it as you go. When all the tarts are filled and formed, bake in a 375º F oven for about 35 minutes, until the filling is bubbly and the edges are slightly browned. Makes 10 3 1/2-inch tarts. Combine flour, baking powder, and salt into the bowl of a food processor. Pulse a few times to mix. In a separate bowl, beat together the cream, egg and honey, then stir. Add the butter cubes to the food processor and pulse just long enough to cut in the butter. There should be some pea size pieces of butter remaining. Dump the dry butter mix into the cream and egg bowl, along with the chev and currants and mix until the batter is just combined and comes together. Again, you still want to have some nice flecks of butter. Turn the dough out on to a floured work surface and pat it into a round disc that is about 1 inch thick. You can make one 8 to 9 inch disc or two smaller 6 inch discs for 2 rounds of slightly smaller scones. Brush the top of each disc with a bit of cream and a drizzle of honey. 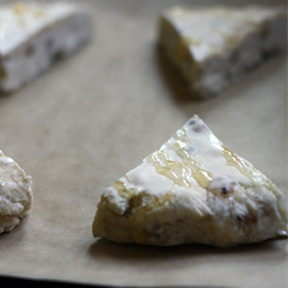 Cut each round in half and then portion each half into thirds for 6 larger or 12 smaller scones. Transfer to a parchment lined baking sheet and bake in a 350º F oven for 15-20 minutes until scones are just slightly golden and brown. Makes 6 large or 12 smaller scones. Put currants in a saucepan and drizzle a spoonful or two of honey over berries. Bring to a gentle simmer and cook over low heat, sort of mashing up the berries as they cook. Taste occasionally and added enough honey to reach your desired sweetness. Simmer for about 15-20 minutes. remove from heat and strain mixture through a jelly bag of fine meshed sieve. Store syrup in fridge. 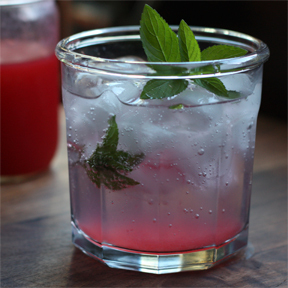 Add 1 to 3 tablespoons syrup to club soda, lemonade, or vodka. Garnish with mint or lime. Alternatively, cook down the currants further and use it as a sauce for meats, yogurt, or ice cream. Thanks Jill! I’m glad you had fun. I’m excited to try out some of your recipes. 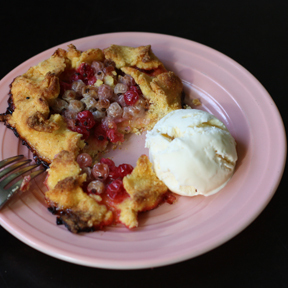 (The tart with a custard filling sounds perfect :) You’re right that the the currant syrup when cooked down longer makes a great sauce for meats. Try adding in some dijon mustard and basting onto porkchops. What a great way to start my morning . . . not with currant anything to eat, but reading your lovely prose, and just thinking about currants. It brought back memories of the currant bush at my grandparents’ home in Waterloo, Iowa. Now when I pick up a box of the little jewels at the farmers’ market, I’ll have an idea what to do with them. Yum! I’ve only ever seen dried currants what a fun introduction to fresh. I’ll have to search some out. Thanks! Currants always look so good at the store. I’m always tempted to buy them this time of year. Now I know what to do with them! Brought back fond memories Jill. We had currant bushes at my Grand Mother’s house on Laurel Avenue.